A well-off target audience guarantees you relevant clicks and high conversion rates. Over 75% of users are searching for products and services. Make sure they find yours first. 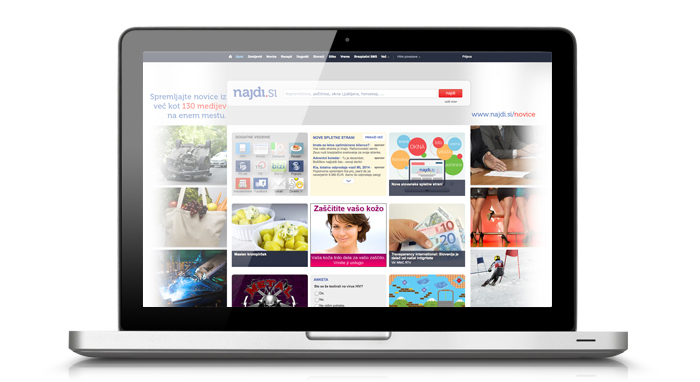 Najdi.si has been among the top 10 Slovenian websites for over a decade. It’s monthly visited by over 280,000 unique users (according to MOSS). NAJDI.SI MONTHLY ATTRACTS OVER 420,000 VISITORS WITH ITS DIVERSE CONTENT AND USEFUL TOOLS SUCH AN INTERACTIVE MAP. ADVERTISE ON NAJDI.SI AND PERSUADE THEM. WE GUARANTEE YOU HIGH AD VISIBILITY AND ABOVE AVERAGE EFFECTIVENESS WITH OPTIMALLY POSITIONED AD UNITS. YOU CAN REACH YOUR OBJECTIVES WITH DISPLAY AND OTHER AD UNITS. ARE YOU INTERESTED IN ADVERTISING ON NAJDI.SI?